Thomas Dunne Books, 9781250024879, 576pp. Murder in the nineteenth century was rare. But murder as sensation and entertainment became ubiquitous, with cold-blooded killings transformed into novels, broadsides, ballads, opera, and melodrama-even into puppet shows and performing dog-acts. Detective fiction and the new police force developed in parallel, each imitating the other-the founders of Scotland Yard gave rise to Dickens's Inspector Bucket, the first fictional police detective, who in turn influenced Sherlock Holmes and, ultimately, even P.D. James and Patricia Cornwell. 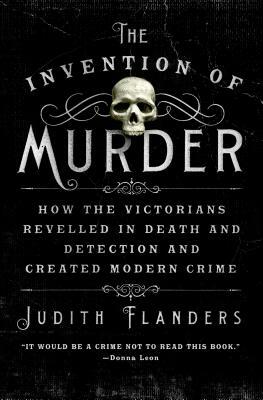 In this meticulously researched and engrossing book, Judith Flanders retells the gruesome stories of many different types of murder in Great Britain, both famous and obscure: from Greenacre, who transported his dismembered fiancée around town by omnibus, to Burke and Hare's bodysnatching business in Edinburgh; from the crimes (and myths) of Sweeney Todd and Jack the Ripper, to the tragedy of the murdered Marr family in London's East End. Through these stories of murder-from the brutal to the pathetic-Flanders builds a rich and multi-faceted portrait of Victorian society in Great Britain. With an irresistible cast of swindlers, forgers, and poisoners, the mad, the bad and the utterly dangerous, The Invention of Murder is both a mesmerizing tale of crime and punishment, and history at its most readable. JUDITH FLANDERS is an international bestselling author and one of the foremost social historians of the Victorian era. Her book Inside the Victorian Home was shortlisted for the British Book Awards History Book of the Year. Judith is a frequent contributor to the Daily Telegraph, Guardian, Spectator, and the Times Literary Supplement. She lives in London.